Sometimes I like to spend hours on one card, but sometimes I like things to move a little faster. 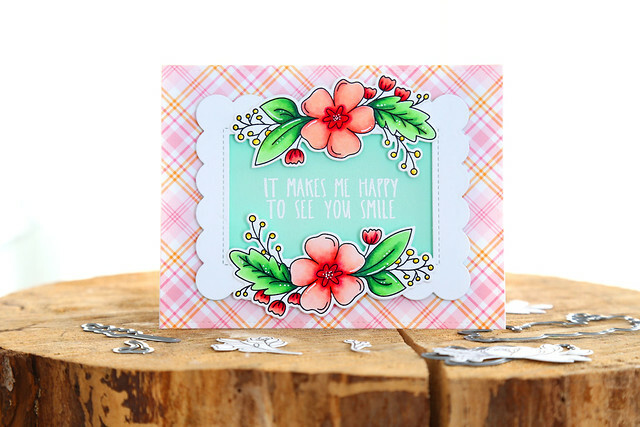 I've made 2 cards, using products from the Ellen Hutson store, that I made in 30 minutes or less. I colored the bunny from Party Pals, and stuck him onto a banner that I hand-cut. 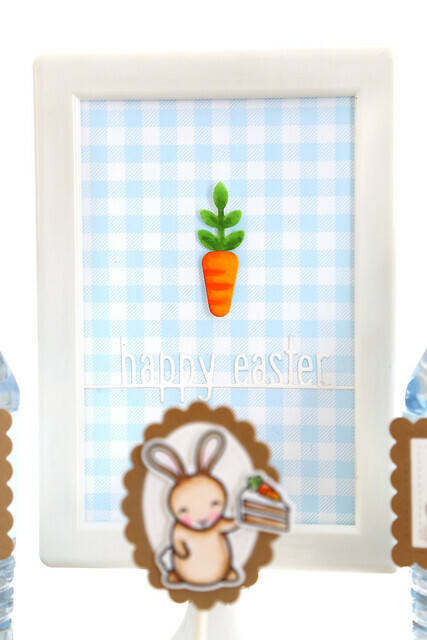 I adhered the Happy Easter line border in lieu of a stamped greeting. 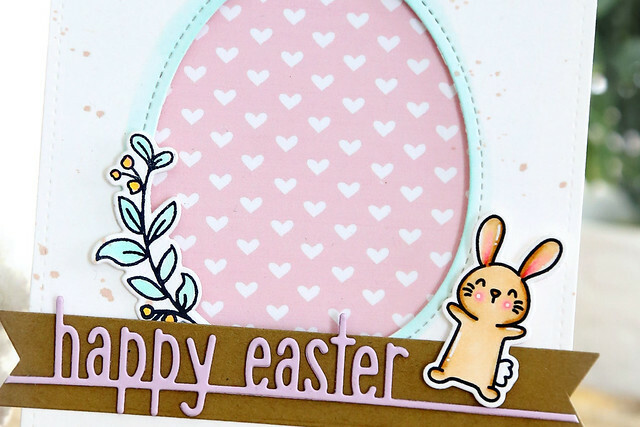 I cut into my white cardstock using the Outside In Easter Egg Stackables die, and lined the back with some Avery Elle patterned paper. I added a little sprig, from Magical Day to balance out the images and add a soft touch. 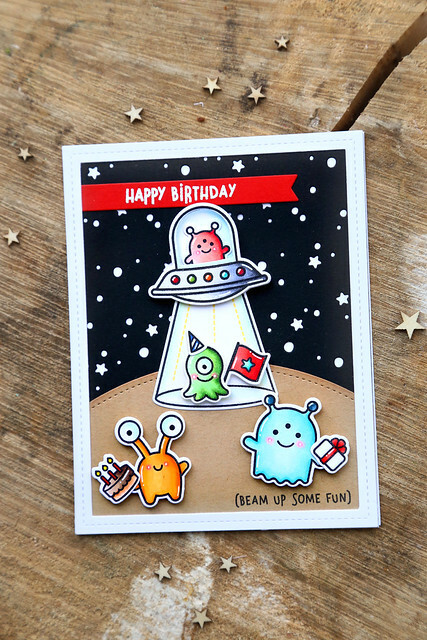 My next card is for a last-minute birthday card that I forgot to make until the morning-of. ack! 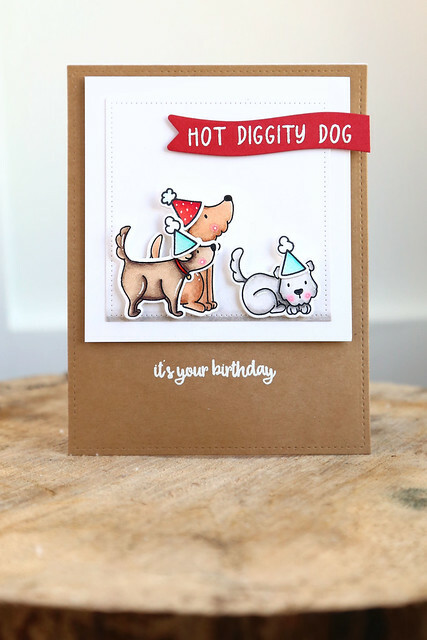 I used the sweet dogs from Dog Lady, and gave them party hats from Puppy's Favorite Things. I also used the sentiments from that set to complete the card. I hope you like them both! If you have to make cards quickly, and at the last minute, here is what works for me: don't worry about the layout. ha! The longest part of designing a card, for me, is figuring out an interesting layout. Here, I colored images and didn't think too much about anything. I used the bunnies from Some Bunny to create all of the decor. 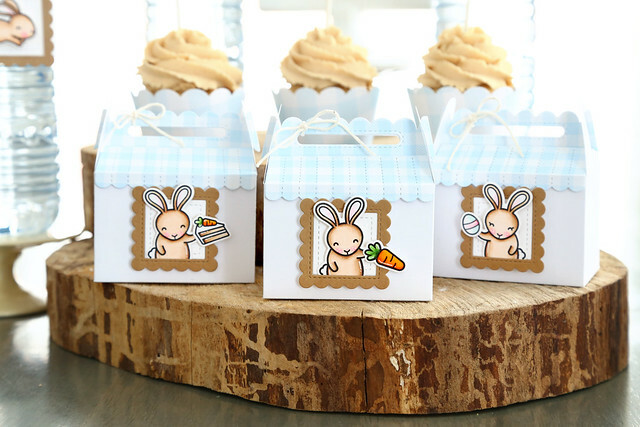 I popped the bunnies into Mini Picture Frames for simple and sweet cupcake toppers. 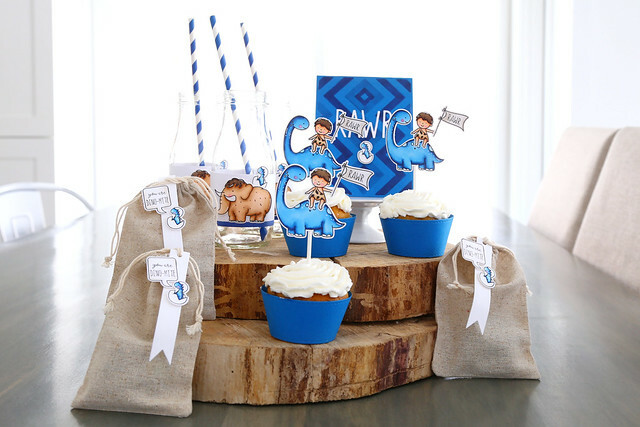 Kraft and blue gingham are a pretty match! 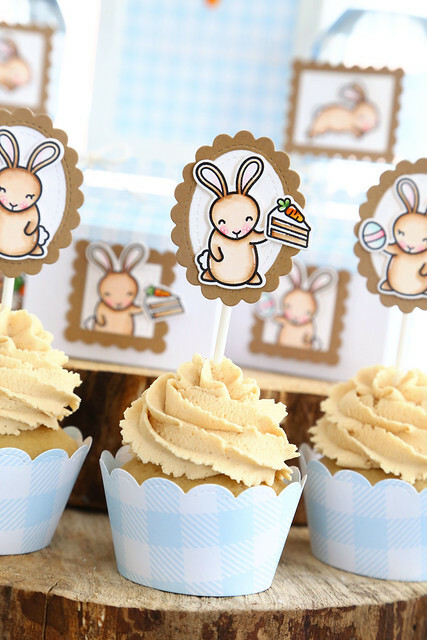 I used our Stitched Scalloped Cupcake Wrapper for the cupcake bases. Just an aside: I've had to cut dairy from my diet this year, and to be honest, baking is the only place I really really miss it. I meannnnnnn.... butter! I can do the cakes with no butter, but the frosting is where I keep struggling. I hate the way shortening coats your tongue! It feels so gros. This peanut butter vegan frosting is delish. I should have thinned it out and whipped it more, but it was so tasty. In case you're in the same boat, I used this recipe for the frosting - click! Back to the party! 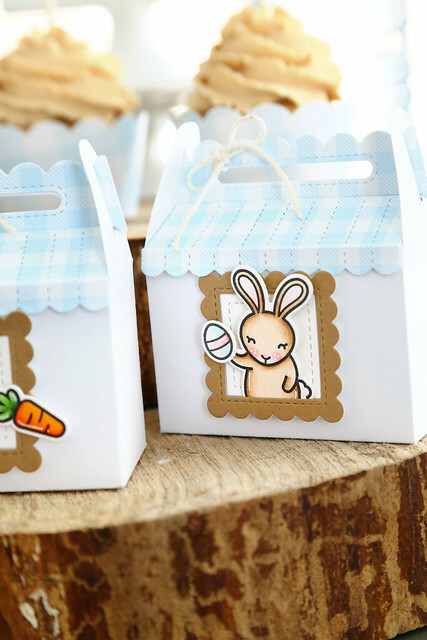 I created little treat boxes using our Scalloped Treat Boxes. I not only cut a gingham roof (using the Scalloped Treat Box Spring House Add-On) but I also cut a second handle out of the gingham so that it continue to the top. 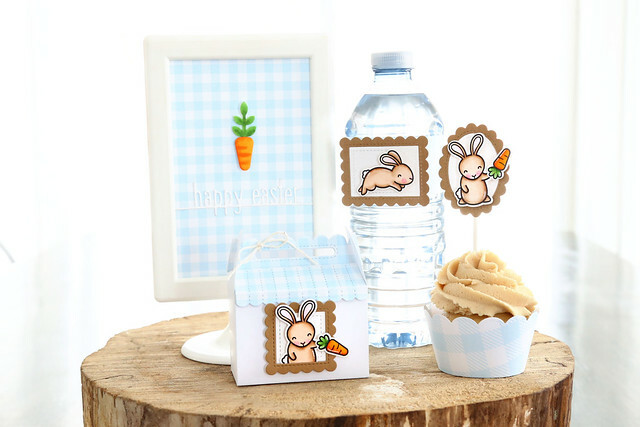 The Happy Easter Line Border and little carrot die made for a cute table sign. I cut all of the pieces out of white cardstock and used copic markers to color the carrot. I find that much simpler than taking out all of my colored papers, and I love the soft look that it gives! 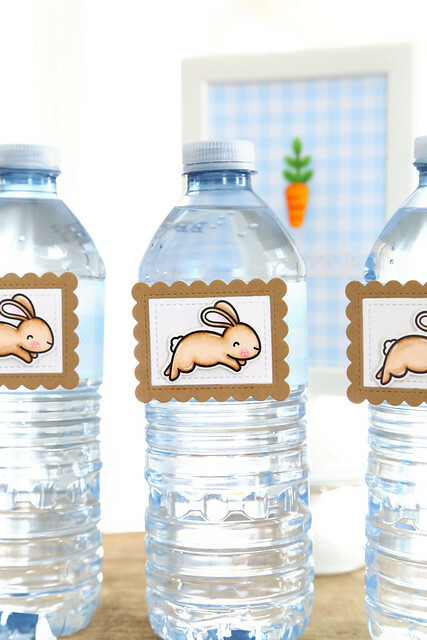 These water-bottle wrappers were the last pieces I created for the party. I hope this sparks your own creativity! Thanks for stopping by. I'm thrilled to be on both the Ellen Hutson and Avery Elle teams, and today they are joining together to show off Avery Elle's new line of watercolors. I did a quick wash, waited for it to dry, and then went back in again on the right side to add a bit more depth and color. I flicked on some of the Cherry watercolor to make pink flecks, and did the same with some white ink. 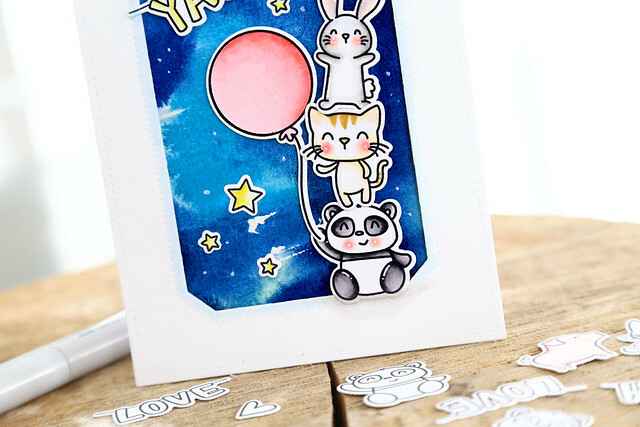 The animals and balloons were all colored using copic markers. Lawn Fawn's March inspiration week is on the blog all week, with new products being highlighted every day. 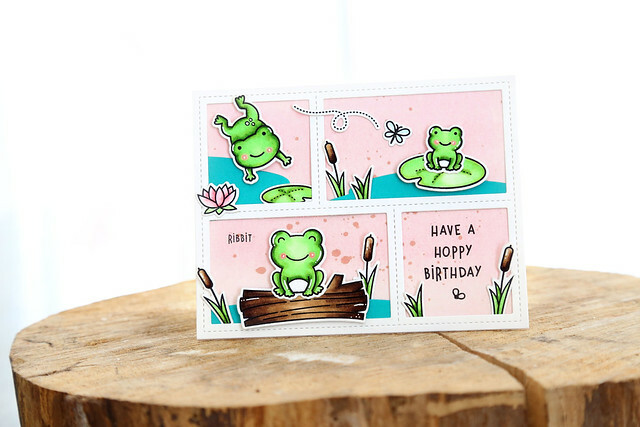 Today, we're showing off the super cute set, Toadally Awesome. 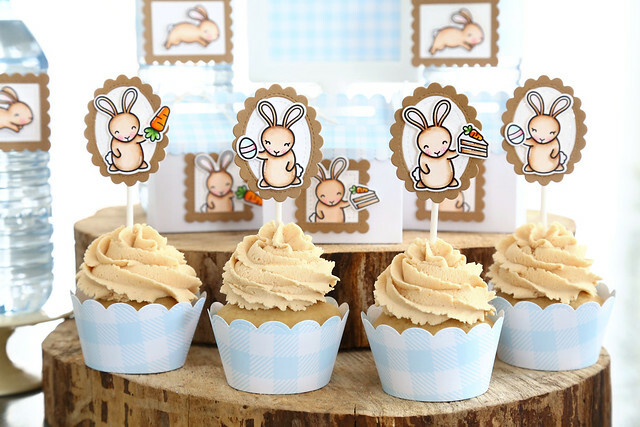 I couldn't help but use the Peekaboo Backdrop again, and create mini scenes within each panel for a "hoppy" birthday card! The pink sky gives it a sweet look. I used green Watercolor Wishes paper for the rolling hills, and gave it a blue Gotta Have Gingham sky. 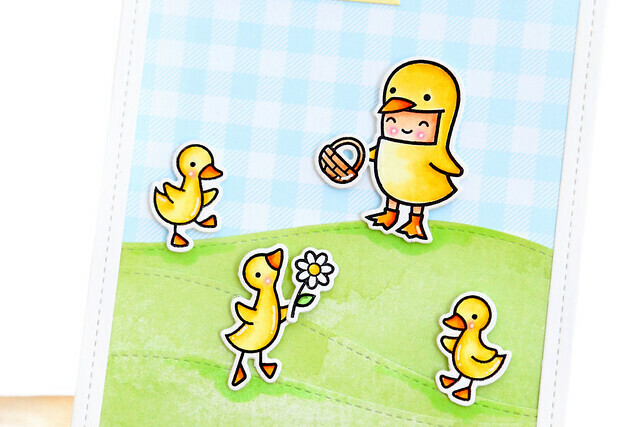 I added a row of spring flowers at the bottom, from Simply Celebrate, and little ducklings from Rub-A-Dub-Dub. They are hanging with the kid-in-duck-costume, from Easter Party. 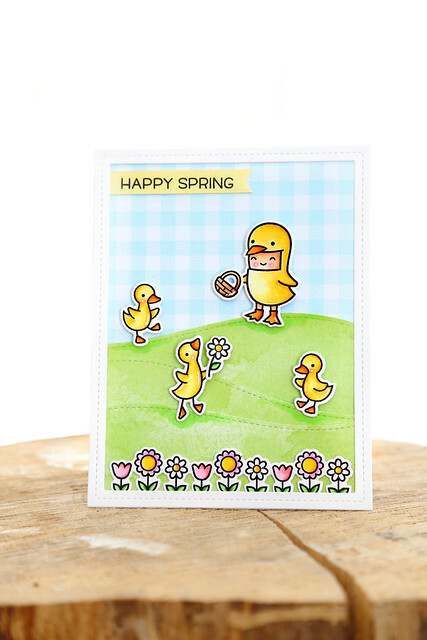 This card just screams SPRING to me! Now, if our weather could start catching up I'd be super happy. I hope you like my cards! There's more to see on the LF blog all week - click! 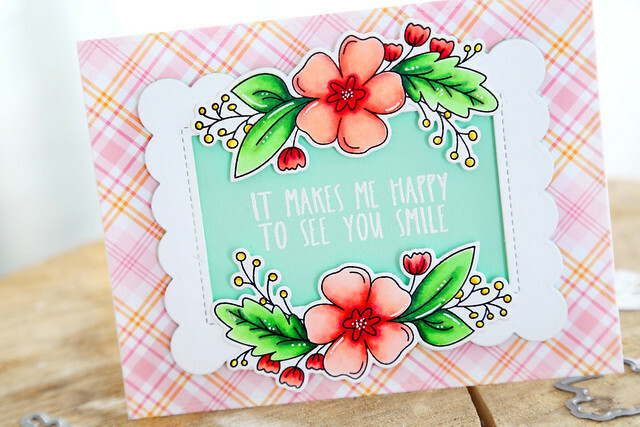 Lawn Fawn inspiration week continues with a closer look at Simply Celebrate. I thought the little flower border would look cute paired with the flower-girl from Easter Party. 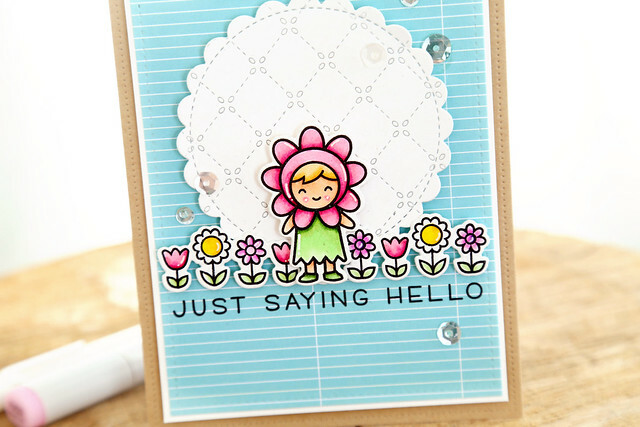 I layered them together, added a sentiment that spanned the width of the flower border (from Simply Sentiments) and popped the focal images onto a scalloped circle that I embossed using the Quilted Backdrop die. I missed posting for the first 2 days of this month's Lawn Fawn inspiration week, so settle in for a longer post with more pictures! 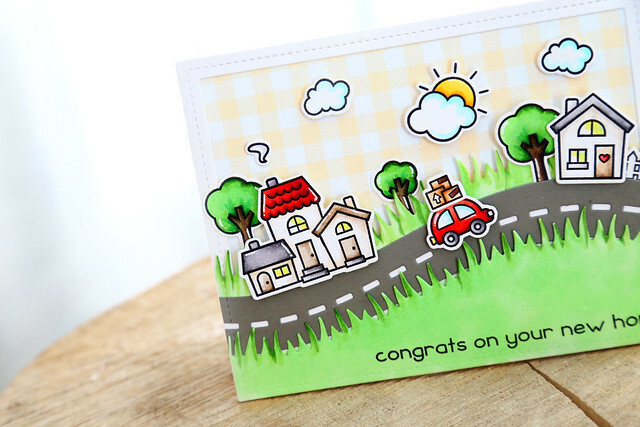 The Road Border and Grassy Hillside Borders were such a natural match for this stamp set. 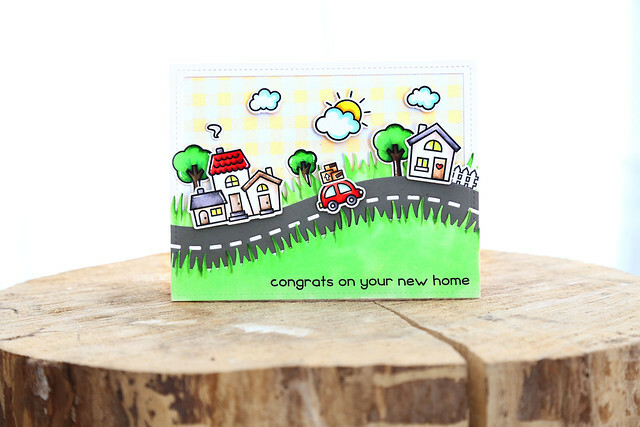 And the yellow Gotta Have Gingham paper makes this card extra happy and sunny! I love this die so much! 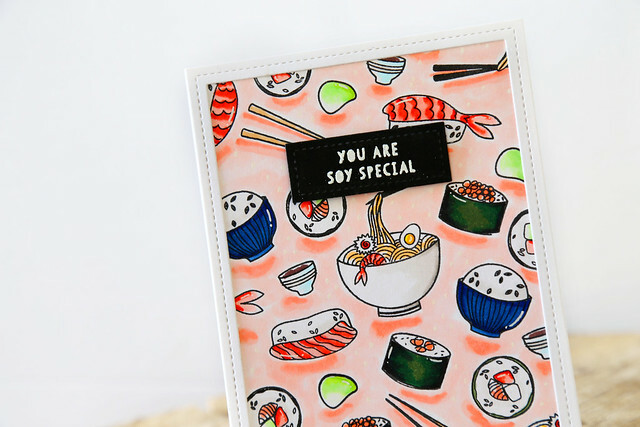 It makes for an easy card-front design that looks so full and fun. I used images from Rub-A-Dub-Dub and back all of the scenes with Gotta Have Gingham paper. 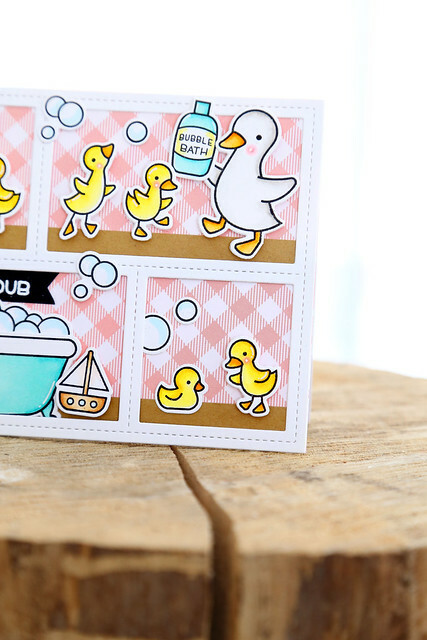 I love the little duck at the bottom checking out the rubber duckie. haha. I ditched the pastel colors for more primary colors here. 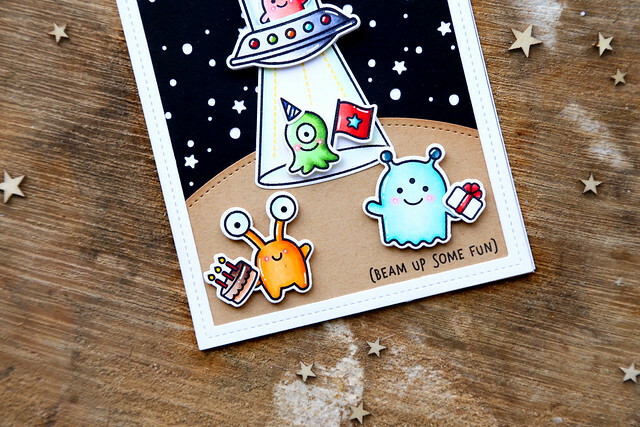 I love that the aliens are bringing the party goodies and waiting to be beamed aboard the party ship! I hope you like my cards! Check out the LF blog this week for more inspiration from the rest of the team - click! 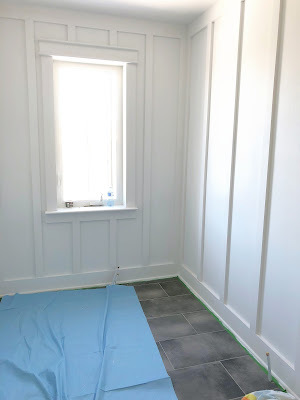 We're knee-deep into a bathroom renovation! A few weeks ago, our kitchen ceiling started leaking onto my hubby's head so we had to rip up the kids' bathroom right above. It's been a bit chaotic! We spent Friday and Saturday filling nail holes, caulking a million joints, and painting these beautiful new moldings. The plumber comes back tomorrow to start putting things back together - yay! I love the new Pierced Mat Elle-ments - they helped to frame my focal image, which really pops in contrast to the white frame. I used the new watercolors to create a very easy background. I wet my watercolor paper first, and then dropped blue watercolor on top and let the water do all of the hard work. I used only one watercolor: sapphire. It's cool to see all of the color variations you can get from one color! 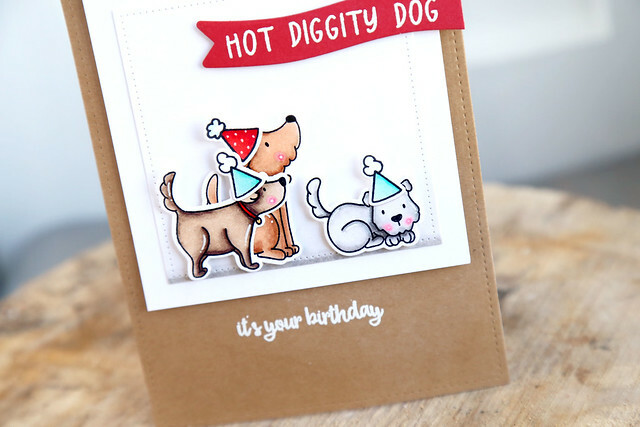 Then, I stamped, colored and die-cut images from Party Pals. Aren't they the cutest? I colored more than I needed, so I will definitely be using them again on future cards. 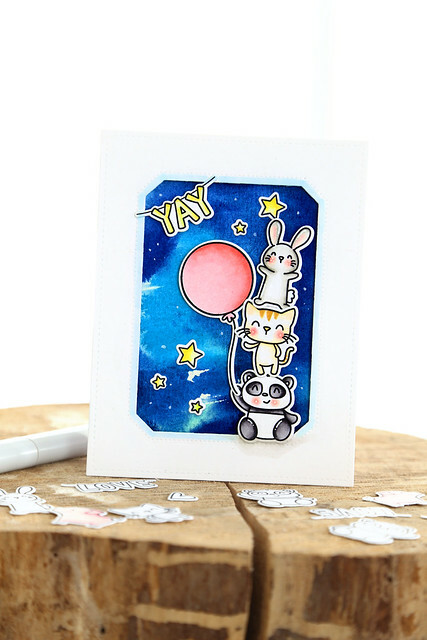 I stacked them like a totem pole, added a huge pink balloon and let the "yay" banner be the sentiment for the card. I like keeping cards with ambiguous sentiments in my stash, you know? It could be used for almost anything now. 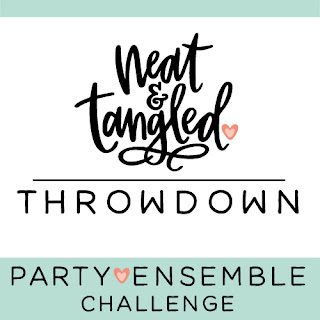 For the last several years Neat and Tangled has hosted a bi-weekly and then monthly challenge called Little Tangles. 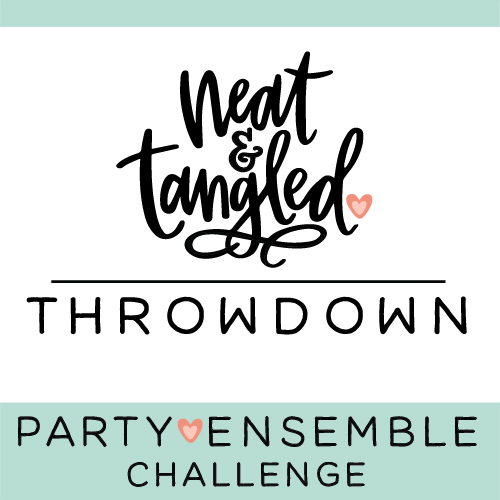 Although they elected to discontinue that this year, they still wanted to host periodic challenges because we love to see what you guys create using Neat & Tangled. These quarterly challenges will be be more complex and bigger, and by bigger we are also referring to the prizes! I used the images from Prehistoric to create the party ensemble. I have to admit that this is still one of my favorite sets! 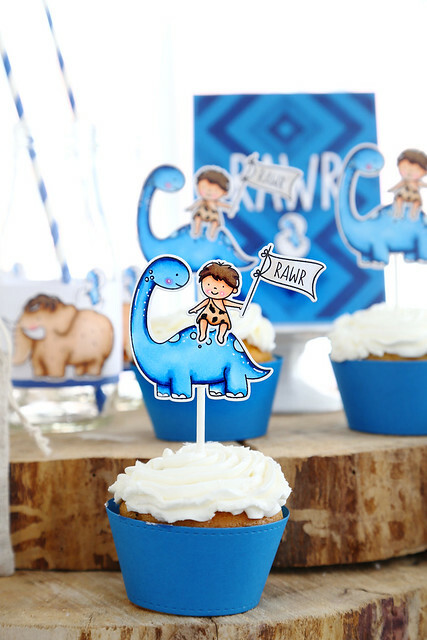 The little boy riding his dino would be perfect for a little boy's birthday party or a boy's baby shower. I colored all of the dinosaurs a fun blue and cut cupcake wrappers to match. 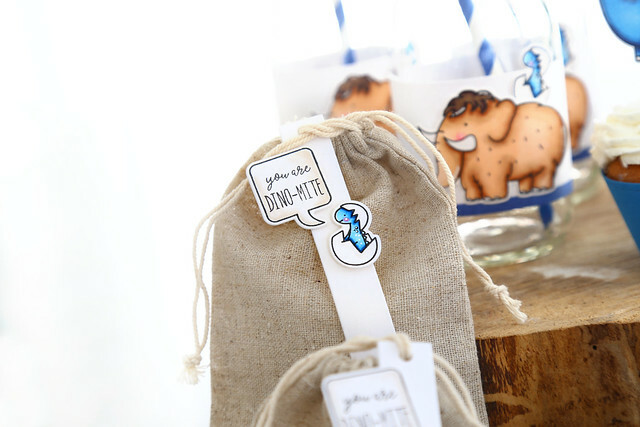 There is candy inside these fabric favor bags, and I used the tiniest dinosaur on a flag die-cut (from Classic Tag 2) to add that pop of blue that was being carried throughout the decor. 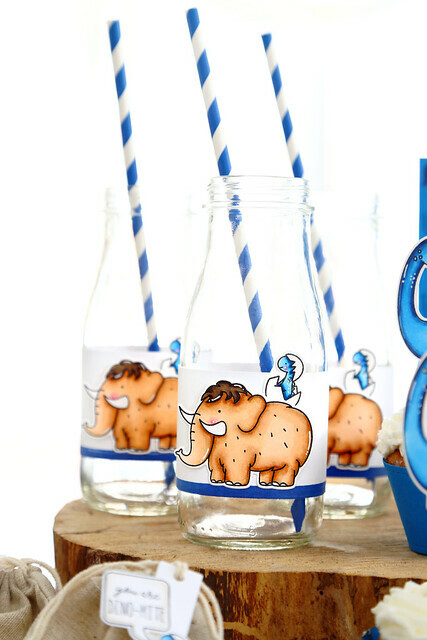 The mammoths are definitely not blue (but so cute!) 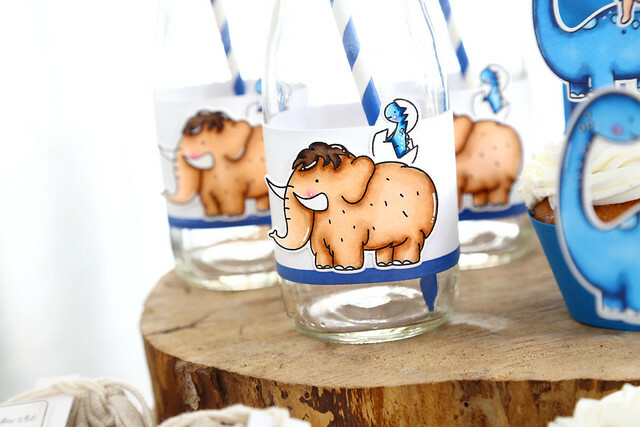 so I added striped straws, and the tiny dinosaur again on the drink bottle labels. Before adhering the mammoth and his dino buddy, I took a navy copic marker's highlighter edge and drew a stripe at the bottom of each wrap-around-label. Last, but not least, I created a table sign using the new Square and Chevrons cover-plate. I love this die! I opted to cut it out of a blue cardstock, and then used different blue markers to color the different pieces before putting them all back together. 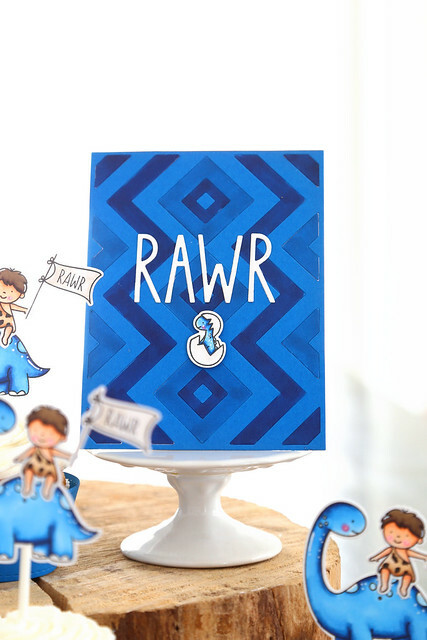 The "RAWR" - cut using the journaling alphas - stood out in their bright white. 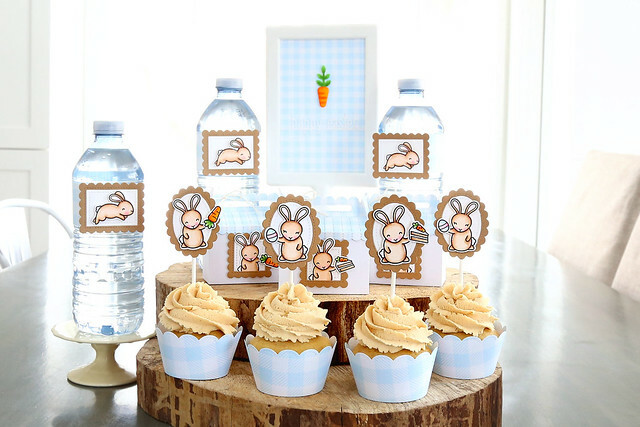 Head over to the NT blog to link up your own party decorations using NT products and you could win big! What is the prize you ask? The winner will receive the entire May Neat & Tangled release and will be invited to take part in May release week! That is huge! I can't wait to see what you create! 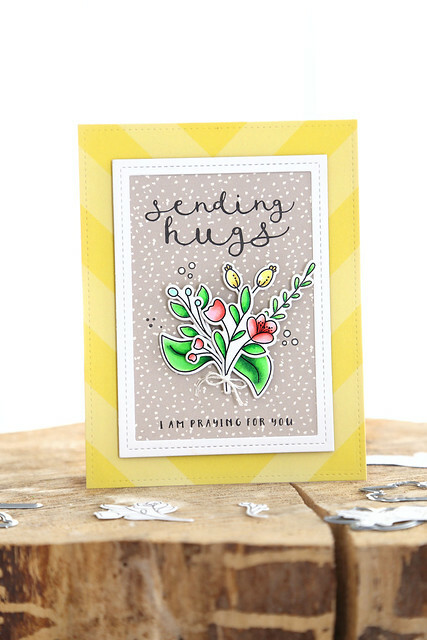 I'm here and on the EH classroom blog with a few cards showing off the new Essentials by Ellen sets, designed by Julie Ebersole. They are SOY much fun! 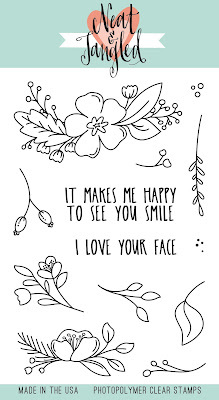 I made 2 cards to share with you today. 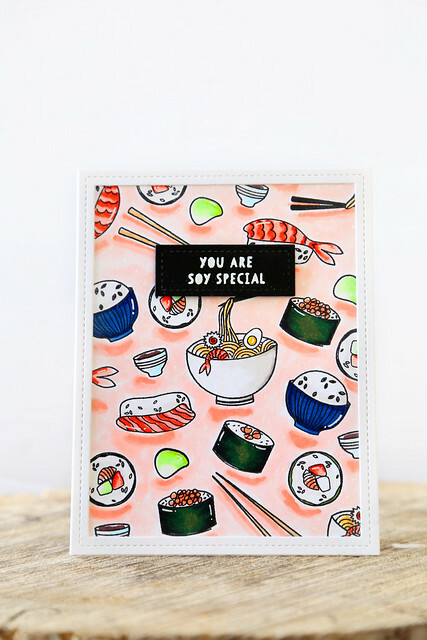 My first card uses the Wasabi stamp set. I couldn't decide which images to use, so I stamped myself a full background. I love, LOVE coloring so I opted out of using the images that would do all the work for me. I sat there and colored while texting my husband to tell him to bring us home some sushi. Once all of the images were colored, I colored the background with a very light pink marker (I know some of you will let me know that I am crazy to do this) and then used a darker pink to add shading under each image. I also used a white gel pen to add little dots, but it's hard to see in the photos. 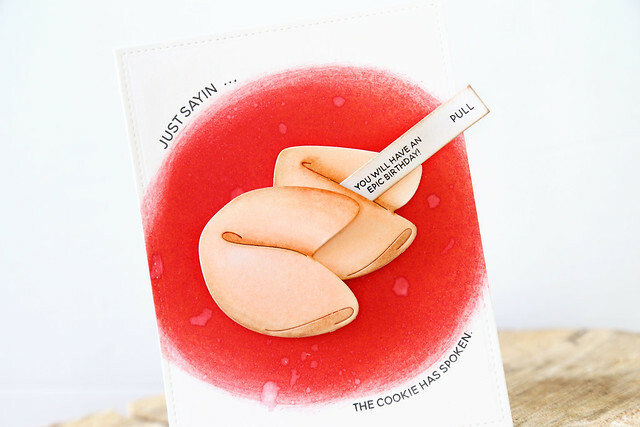 My next card uses the new Good Fortune stamp set and Fortune Cookie dies. You guys, these are so great. I made up for taking so much time coloring the first card and whipped this one up right quick. 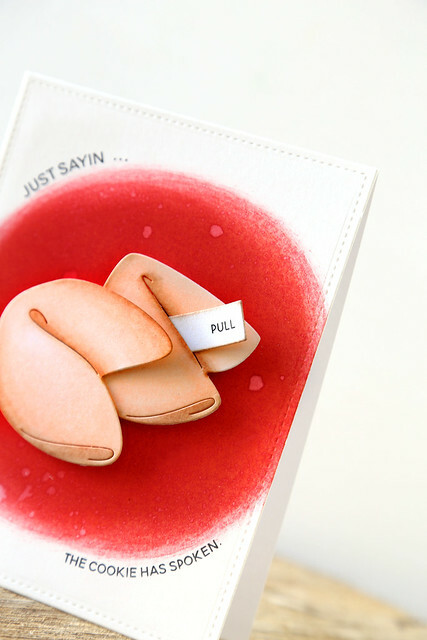 I used a sponge and red distress ink to rub a "lucky" red circle onto my card-front. I then got too handsy with the water droplets, but I decided to run with it. They are not subtle, lol. I curved my favorite sentiments around the top and bottom of the red circle, and popped my fortune cookies in the middle. The best part... pull on the fortune. I hope you like what I've created using the new sets! Check them all out in the EH store - click!